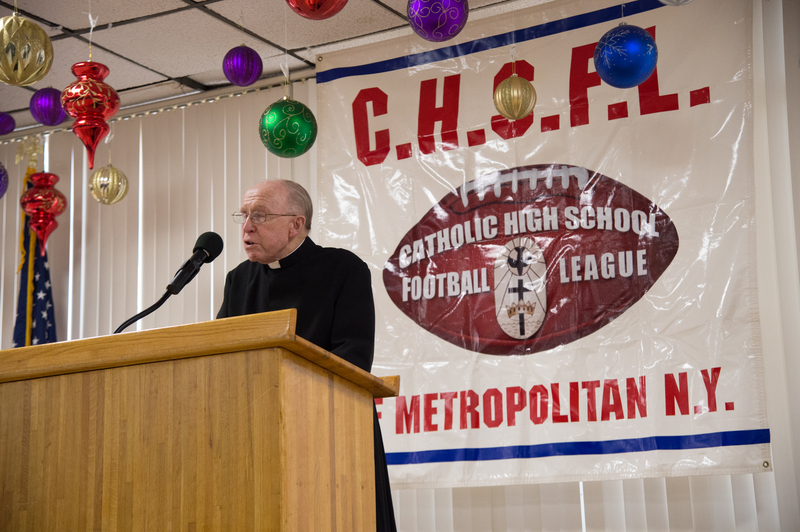 By Matt Diano: Celebrating the conclusion of yet another exciting, action-packed, and character-building season of New York Catholic High School football, the best of the best in the NYCHSFL gathered together one final time on December 3rd, to take part in the cherished and incomparable tradition of the Annual Communion Championship Awards Mass & Breakfast. Addressing his congregation, Father Albert Bertoni SM, spoke candidly and passionately about the importance of reflection during the Advent season and how we, as Catholic sons and daughters are called to take a step back from the daily “hustle and bustle” and instead devote our time toward relaxation and properly preparing for the return of our Lord and Savior, Jesus Christ…..”Preparation”, whether it be in regard to making a place in our lives for Christ or in bringing glory and dignity to our schools via our play on the football field was a theme that naturally permeated the hearts and minds of those young men who were blessed and gifted enough to be revered and decorated as worthy of being a 2017 honoree…..Starting way back in late-August/early September, these blessed student-athletes poured every ounce of their being into being champions, on and off of the field….And, by the grace of God, they were elevated above the rest and will forever be remembered and treasured by virtue of their selection…. In looking over the list of distinguished parties, I can truly say that there were no finer and more deserving alternative than the men cited/profiled below. Winning what many consider the most significant award of the morning, the Monsignor Matthew Peters Award, for the league’s most outstanding student-athlete, would be Fordham Prep senior quarterback, Matt Valecce…..An individual whose feats in the classroom are as impressive and inspiring as his heroics on the football field, the future signal Caller at Boston College must made it a pattern during his 3.5 years in the Bronx of being the head of the class in all endeavors….The proud owner of a 4.28 grade point average (on a 4.0 scale), as a student, Valecce has been recognized as a General Excellence and scholarship recipient by his school during every step of his scholastic journey….With regard to gridiron accolades, his resume needs no introduction and speaks for itself in evert possible way. 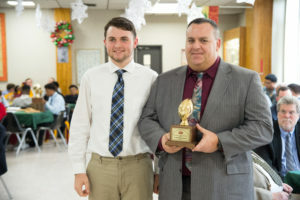 A four-year starter who led the Rams to the “A” Division crown as a 9th grader, what he did in 2014 was simply the culmination of what would grow to be one of the finest high school careers ever by a New York State quarterback….A soon-to-be three-time All-State honoree, the FP captain would throw for 10,027 yards in his career (2nd all-time in NYS) and toss 112 touchdown passes (3rd all-time)….In this, his swan song campaign, the living CHSFL legend would leave nothing in the proverbial tank, setting career highs with 3,333 yards and 41 touchdowns thrown in leading his school to a runner-up finish (10-2) in the Double-A division….Simply put, Valecce was such a once-in-a-lifetime talent that I feel confident in stating that I will never see another of his caliber during my lifetime. 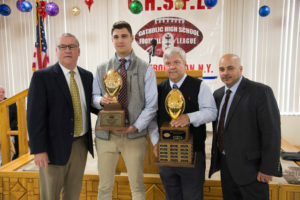 Honored for their ability to light up the scoreboard in the blink of an eye were a pair of juniors—Roberto Auguste (Xaverian) and Matthew Sluka (Kellenberg), as well as a departing senior who garnered serious consideration to be last year’s honoree, Lucas Nunez (Cardinal Hayes). 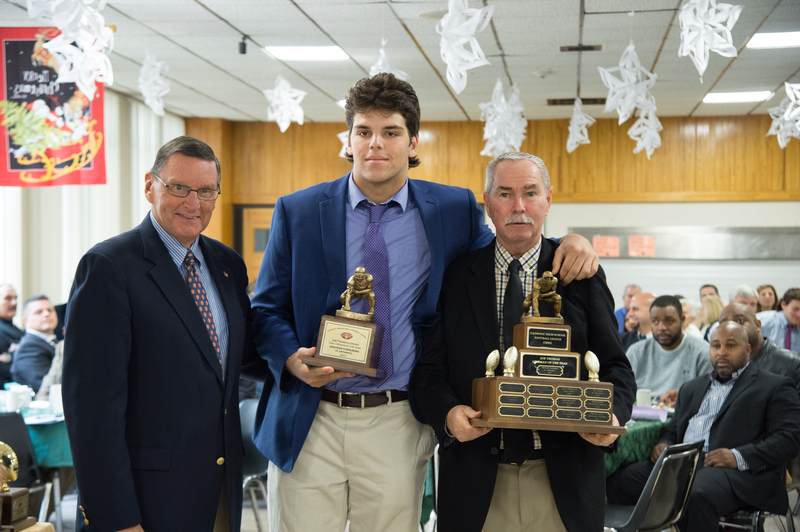 An All-Catholic selection as a 10th grader in 2016, it came as no surprise that the Clipper junior [Auguste] would have a knack for taking over every game in which he played….Surpassing the 100-yard barrier on five different occasions this season, Head Coach, Mike Jioia’s star pupil was a runaway (no pun intended) leader in the “A” Division in all major rushing categories, accumulating 1,196 yards (more than double his next closest challenger) and finding the end zone on the ground 14 times (five more than the #2 person). His yards per carry average of 7.4 was also tops among all backs who had 50 or more attempts….As Auguste went, so too did Xaverian, finishing as the “A” regular season champs with an unblemished record before advancing to the title game where they just barely fell short of their second title in the past three seasons….2017 marked the second time in the past three years that the Offensive Player of the Year was won by a Clipper. In 2015, it was Phil DePaulis hoisting the trophy. 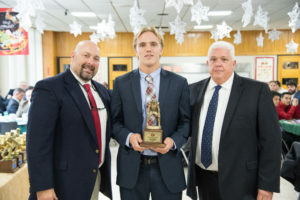 Described by his coaches as “One of most dynamic players to ever step on the field for Kellenberg,” Sluka’s legacy was cemented when he did something no other Firebird field general had ever done by leading KMHS to an immaculate season (11-0) en route to winning their first AA title in history and the first title of any kind since 1999 (A champs)….Nicknamed the “Redheaded Assassin” by me, the Roselyn resident would do something unheard of when he topped all rushing categories in Double-A from the quarterback position….Recently named to the All-Long Island 1st Team (the lone Catholic representative on the list), Sluka ran for 1,619 yards and 24 touchdowns in 2017. Three separate times this season, he not only surpassed the 100-yard plateau in a game, he blew right past 200+ yards, including a 17 carry, 238 yard, 5 touchdown performance during championship weekend that earned him Offensive MVP recognition….While not the featured part of his game, when asked to play the role of the traditional drop-back passer, Sluka would thrive in this regard as well, completing 61.3 percent of his 93 attempts to rack up 984 yards and 10 touchdowns in the air…If 34 touchdowns and 2,603 yards of total production are not enough to convince you, let it be known that he was also stellar as a place-kicker, converting on 32 of 40 PAT tries….Of the 424 points scored by the Firebirds as a unit this season, Sluka had a direct hand in 236 of them (56 percent)…..A natural leader and born winner, in less than one calendar year, Sluka’s has been instrumental in delivering titles in two different sports to Uniondale. 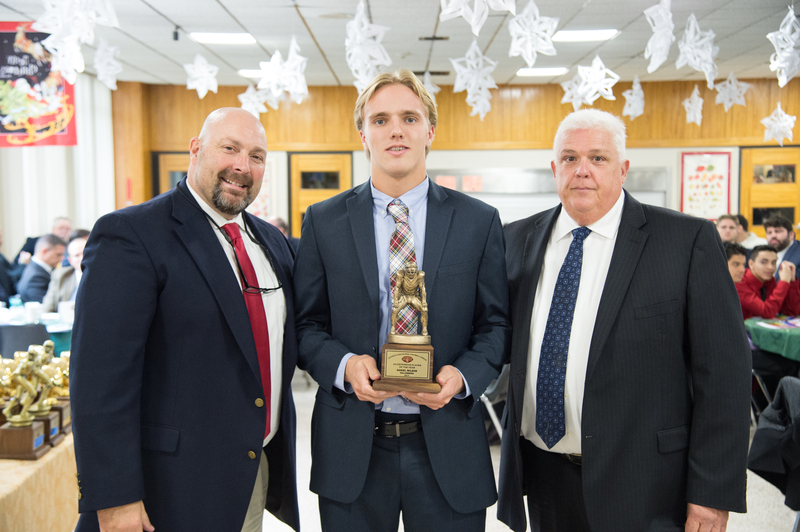 Last spring, he was a key member of a Kellenberg lacrosse squad that claimed the 2017 AA Catholic State crown….Sluka is the first Kellenberg player since Bobby Mossa (2014) to win Offensive Player of the Year. 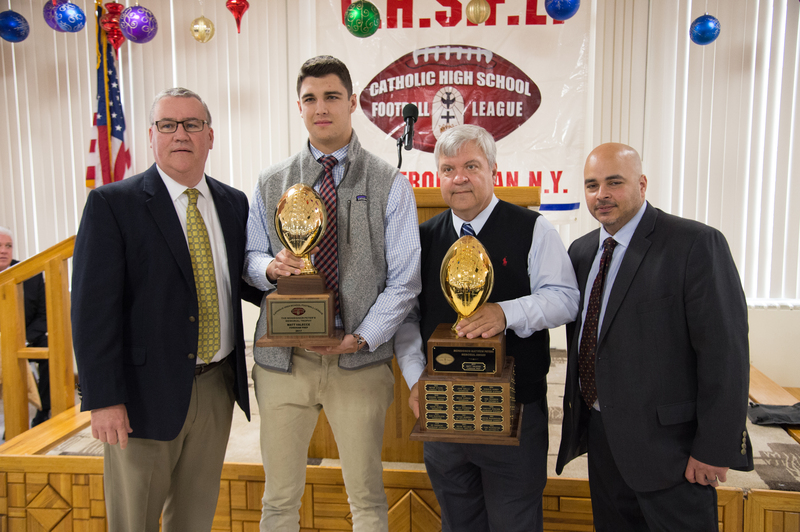 A second-team All-State pick as a junior, as well as a unanimous All-Catholic selection following a 2016 campaign that saw him make 58 catches for NYS bests of 1,582 yards and 21 receiving touchdowns, when we said that Nunez was a very viable candidate to win the Joe Riverso Memorial Award as the top Offensive Performer in AAA a season ago, we were not overstating his value…..As dangerous a play-maker as the CHSFL has ever seen, the Sacred Heart University bound wide-receiver missed a few games at the onset of his senior season, but still managed to be the #1 yardage gainer in all of New York State in 2017, accumulating 1,400 yards on 66 grabs (4th in NYS), with 15 (2nd in NYS) of his catches resulting in touchdowns…An individual who was both dominant and consistent, Nunez would post 100-yard receiving games in all but one (92 yards in his return from the injury) appearance this season. Only twice in 2017 was he kept out of the end zone for a full 48 minutes, compared to three occasions that witnessed him catch three TD passes in a single outing…Of the nine games he played in his finale year as a Cardinal, he recorded multiple TD games in six….Nunez closes out this chapter of his scholastic career ranked 5th All-time in the Empire State for total receiving yards. He is the second straight Cardinal Hayes standout to earn the Riverso. In 2016, he was beaten out by teammate, Christian Anderson (currently playing at West Point). While offense has always been the side of the ball that hogs the glory and commands the headlines, if you ask any football purist they will say without the slightest hesitation that the path to the “ring” has always and will forever rest on the shoulder pads of those special young men capable of taking over a game when the ball does not belong to them….In the case of out 2017 Defensive Players of the Year, all three did their part in confining the opinion of the historians, with two—Daniel Wilson (Kellenberg) and Trill Williams (Stepinac)— winning titles in the AA and AAA Divisions respectively, and the “A” selection, Cole Esposito (Kennedy Catholic) leading his school the deepest postseason run in program history. 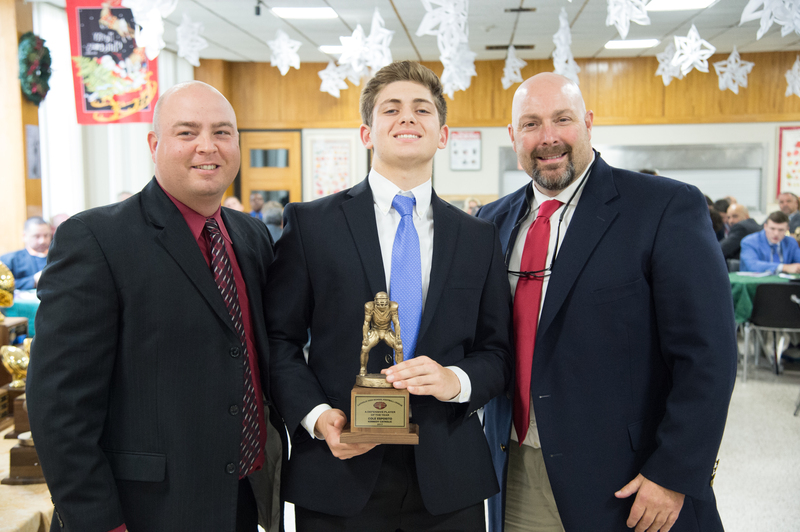 A known commodity on the Gael linebacking corps as a sophomore in 2016, the Cortlandt Manor resident [Esposito] would be a breakout star for the unit this past season, finishing second only to Kennedy teammate, Ed Longest (who we will address later) in “A” ball with 92 total stops…Without question the person who will ceremoniously step into the role of defensive trend setter for Head Coach, Dom Tassone’s squad in 2018, Esposito would be unblockable for the vast majority of his junior season, reaching double digits for total tackles in six of his nine appearances, including a 17-stop effort in a week #4 victory over St. Dominic’s that earned him a berth on the POTW list…An absolute animal during the homestretch of the 2017 season, he added 15 and 10 tackle showings in two of KC’s last three games, propelling them to back-to-back shutouts to give the program their first goose-eggs on the defensive side since 2010….In addition to challenging the century mark for tackles, Esposito final stat line this season included 15 tackles for a loss, three sacks, a pair of forced fumbles, an interception, as well as a blocked punt for the cherry on top…The ultimate compliment that we can give to Esposito is justify why he was a perfect choice is to state that with him taking on greater responsibilities this year, the Gaels saw their points allowed average fall from over 26 PPG to just 17.5….Anytime you can play a part in shaving off close to 10 points, you without question are a gem. 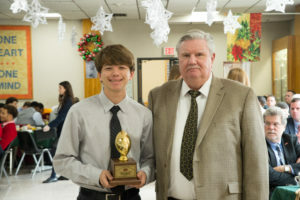 Wilson, whose uncanny ability to roam sideline to sideline like a gazelle fostered a change in position from defensive end to “Mike” linebacker, was nothing short of outstanding in his first season on the Firebird varsity….A three-sport crown jewel who was so special that he was promoted as a sophomore (a rare occurrence for a Marianist school) to both the varsity basketball and Catholic State Champion lacrosse teams, it is a scary though that the Levittown native can be “this good” in what technically might be considered his third athletic endeavor…The team leader in overall stops with 67 (9 TFL), when I watched Wilson play, what immediately commanded my attention was the ferocity in which he could apply pressure to opposing quarterbacks. Never was this unrelenting pursuit of the foe’s signal caller more evident than when he logged three of his season total six sacks in the regular season victory over Fordham Prep that set the tone for the remainder of Kellenberg’s unblemished year….As complete a defensive player as you will find anywhere on Long Island or in New York State, when Wilson was not busy preventing passes from being thrown, he proved quite adept at knocking them down too, ending his junior campaign with six successful pass break-ups…..The anchor/foundation/pulse of a defensive unit that ranked 1st in AA and 2nd overall in the NYCHSFL (surrendered just 13.6 points per game), the United States’ Naval Academy (Lax) commit will have all of next season to further solidify his status as one of the best student-athletes to ever wear the Blue & Gold….While winning the “AA” DPOY would have been a thrill regardless of any surrounding details, an added bonus was that Wilson received this award on his Aunt Christine’s (alumnus of Kellenberg; class of 1993) birthday. 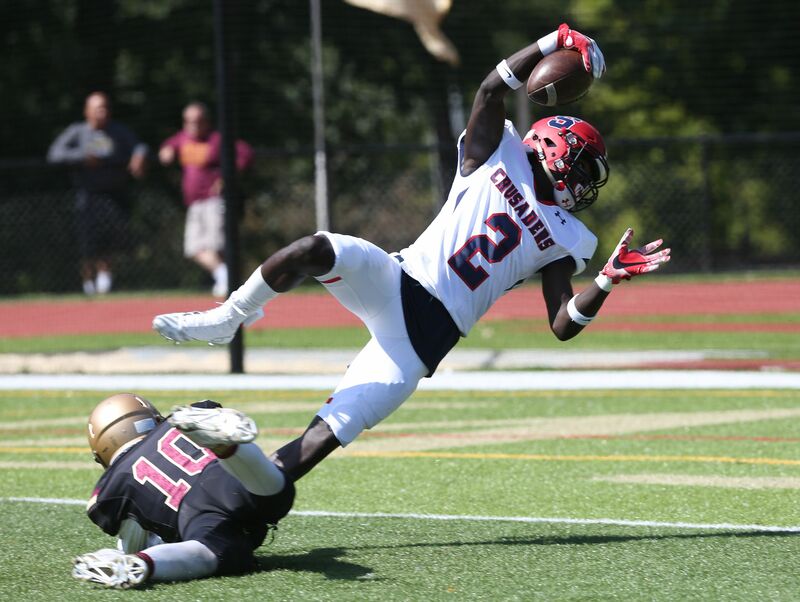 When it comes the man who lived up to the “thrill” nickname, we could write an entire novel and we’d still fail to do him justice…A dynamic and versatile performer who if it has been needed, could have likely been the Offensive Player of the Year for the 2017 AAA League and Catholic State Champs from Stepinac, Williams has been one of, if not the purest and most feared, athletes in the NYCHSFL since he first stepped onto the varsity grass in White Plains as a sophomore in 2015….A specimen blessed with the total package of athletic tools (4.4 speed being among them), if not for an injury that cost him the bulk of his junior season, there is little doubt that the future Syracuse University Orangeman could have/would have been a multiple-year All-State selection, a mainstay on the All-Catholic team, and a very realistic candidate to have been a two-time winner of the Vincent O’Connor Memorial Award….A consistent shutdown presence at the cornerback position, Williams routinely took the opposing team’s #1 wide-out and erased him from the equation for 48 minutes….Finishing the year with a division-high five interceptions (including a combined three in back-to-back weekends in the AAA League and State game triumphs) and adding an astounding 20 pass break-ups, this consummate ball hawk was magic when it came to forcing opposing turnovers, complementing his five picks (one of which was returned for a TD) by forcing five fumbles….As a demonstration of his triple-threat abilities, let it be known that the 13 total touchdowns he scored in 2017 came in four different ways, as he caught six TD balls, ran in five others, had the aforementioned pick-6, and even returned a punt in the AAA league finals….The choice of Williams as this year’s DPOY keeps the streak alive for the Crusaders, as they have now won the award four consecutive seasons, starting with Gavin Heslop in 2014 and continuing in 2015 and 2016 with Dan Negron and Gene Brown. 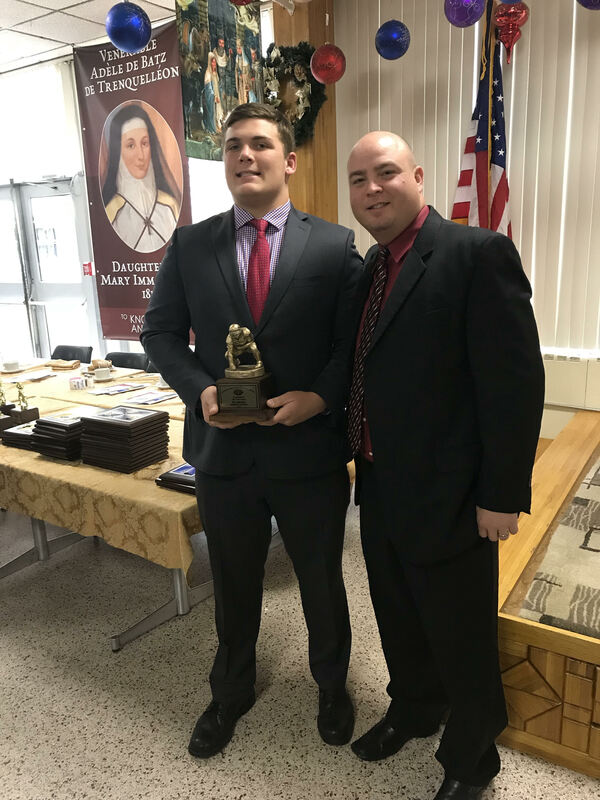 No Player of the Year ceremony would be complete without fully recognizing and showing appreciation for the unsung heroes and resident ironmen within our game, the linemen….Often tagged with the labels of road graders, hole stuffers, QB protectors, and whatnot, no one works harder and needs to be tougher than the boys that bang heads in the trenches….This year’s recipients—Ed Longest (Kennedy Catholic), Joseph Petti (Fordham Prep), and Grayson Cherubino (St. Anthony’s)—all epitomize what it means to be tenacious, courageous, and selfless. In a league that this is rich in interior talent, for these three superstars to be the ones who emerged as the crème de la crème speaks volumes of just how respected and admired they were for their contributions in the “war zone”. Despite not playing one of the so-called glamour positions, Longest, a four-year starter and two-year team captain, was very much the most important player on the Gael roster this season…A shoe-in to have been the recipient of the “A” DPOY if not for the league’s decision to honor him for the full depth of his immense service, the Kennedy senior was a full-fledged dominant force regardless of which side of the line of scrimmage he was occupying….As an O-lineman , Longest was a role model for a unit that helped the Gaels compile 1,889 yards of production (630 in the air; 1,259 on the ground) and score 18 total touchdowns….Defensively, he was the gold standard, leading the “A” division with 101 tackles (6th in the CHSFL regardless of division) and six sacks….A person who lived in the opposing backfield, 18 of Longest’s century-shattering stop total resulted in a loss of yardage. A 2016 CHSAA State Wrestling champion, last weekend was not the first time that Longest found himself being atop the proverbial podium as the envy of his competitors. Hailed by the Ram coaching staff as a “Mountain of a Man”, the 6’6, 295-pounder, Petti, was easily identifiable on the gridiron for much more than just his physical measurements….Another of our two-way studs, when we consider the legendary career of Valecce, it is essential that we remain mindful of the fact that none of it could have been achieved if not for someone the caliber of Petti protecting and affording him a wealth of time in which to survey the field…With the future Navy Midshipman bulldozing anything that got in his way, the 2017 AA runners-up from the Bronx were one of the most lethal offenses in NYS, averaging 30 points and 367.5 total yards per appearance….Unmovable as a DT (which is the spot that he will play at the next level), Petti recorded 19 tackles and three sacks for a defense that allowed less than 20 points per game this season. Joining a heralded club of elite Friar linemen that includes the likes of recent Joseph Thomas Memorial Award honorees, Justin Tustin (2012) and last year’s winner, Dan Lord, Cherubino specialized on the defensive side of the ball, but was so stellar at defensive end, that his comprehensive performance demanded that he be among our chosen few…..The linchpin, backbone, and focal point of a St. Anthony’s defense that ranked 1st in points allowed (16.5) in the AAA division, when speaking about their prized weapon, the Friars’ staff painted him as a linebacker trapped in the body of a DL….A quarterback’s worse nightmare, the future Bucknell Bison was renowned for the tireless effort he put into never allowing the opposition’s signal caller from enjoying a second of peace….Closing out his scholastic career with seven sacks and 12 hurries, as well as 14 tackles for a loss and a pair of forced fumbles, if not for the chaos that Cherubino wreaked on a weekly basis, St. Anthony’s would not have seized the regular season title and advanced to their first championship weekend since 2013. CONGRATULATIONS TO ALL AWARD WINNERS !!! By Matt Diano: Just hours before they donned jerseys one final time in their respective scholastic careers, the incredible student-athletes of the Catholic High School Football League of Metropolitan New York would “suit up” in a different kind of manner, as they, accompanied by family and friends, partook in one of the NYCHSFL’s grandest traditions, the annual Communion Awards Breakfast. 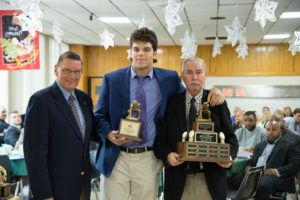 Following the conclusion of the mass, those in attendance received an invite to feast on a platter of the classics— eggs, French toast, muffins, sausage, beacon, as well as “Kellenberg’s famous crumb cake”—-as the best and brightest young men from our league were recognized and honored for their exemplary skill and character, both on and off of the gridiron during the 2015 season. 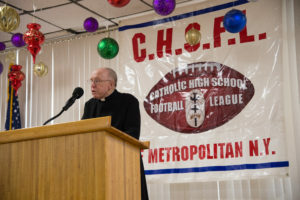 Named in memory of founding father, Monsignor Matthew Peters, the former Principal of Cardinal Hayes, who formed the NYCHSFL in 1954, the Msgr. Peters Award is the highest and most prestigious declaration bestowed upon a Catholic high school football player each year. 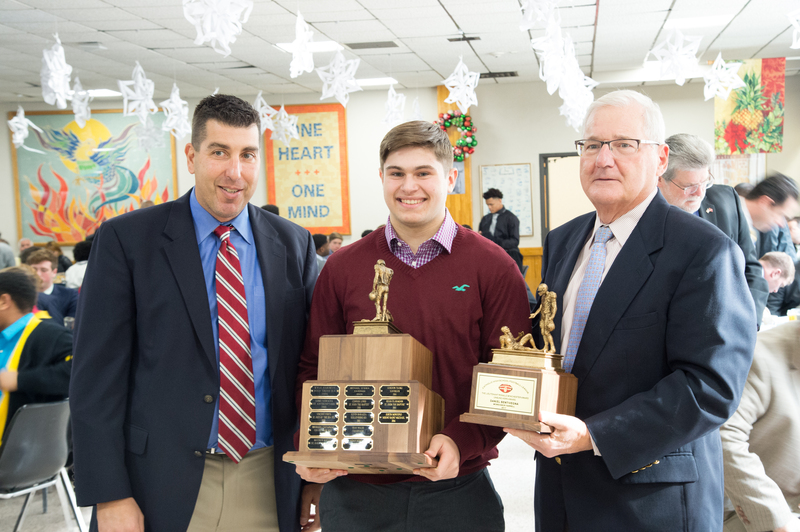 A distinction that is presented to that one individual who most epitomizes what it means to be a genuine scholar-athlete by holding academic excellence superior to athletic pursuits, there could not be a more fitting choice than this year’s honoree, Monsignor Farrell senior captain/field general, Michael Cloppse…Gifted in all categories across the board, Cloppse currently ranks 8th overall in his graduating class with a four-year average of 99.75 and scored an extraordinary 2100 on his Scholastic Aptitude Test…Additionally, the 6-foot, 190-pounder from Staten Island is a beacon and pillar of both his school and his community, devoting his personal time to Hearing Our Heroes (a club that hosts special events that pay tribute to our veterans and service men), the Holy Name Society, and to the Special Olympics. Off campus, he continues to live the word of the Gospel, volunteering as a coach for the challenger football program in Staten Island….Athletically, the 2014 All-State Honorable Mention/2015 All-Catholic team member under center, also shines on the baseball diamond, helping the Lions to a title in 2015…Cloppse will advance his academic and athletic objectives next fall as a member of the class of 2020 at Bowdoin College (ranked #4 by U.S. News & World Report among national liberal arts colleges and universities). 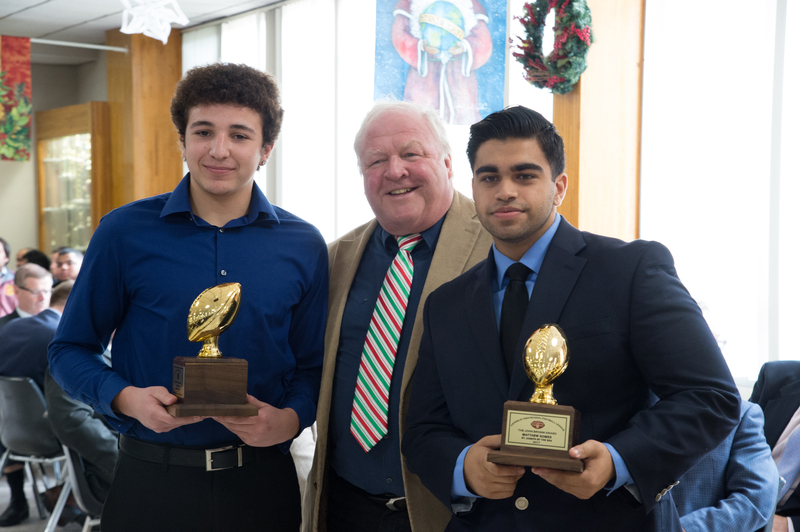 Rewarded for their stellar play with the ball in their hands would be Joe Riverso Memorial Offensive Players of the Year, Tyquell Fields (Archbishop Stepinac; AAA recipient), Jerome Brooks III (St. John the Bapitst Diocesean High School; AA winner), and Phil DePaulis (Xaverian; A Division)…Both Fields and DePaulis led their teams to their respective divisional titles, as each won the Offensive Player of the game in the AAA and A title contests….Brooks, one half of a lethal Cougar running attack [Nicholas Cipolla being the other] that averaged 400 yards per game on the ground, brought his team to the semifinals before bowing out to the eventual champions from Xavier. The owner of a 24-1 record in his two year stint as the signal caller for the Crusaders, Fields not only captained his team to consecutive NYCHSFL AAA crowns, he topped it by delivering to them a 2015 Catholic High School State title, overcoming the pain of a high ankle sprain to throw four touchdowns passes in Stepinac’s 42-28 victory on the road over Monsignor Martin champion, St. Francis High School on November 28th….On the year, the Lohud.com Super 11 selection completed 175 of his 288 attempts for a school record 2,268 yards and 24 TD passes. The dual-purpose quarterback proved himself quite adept with his legs, running for 435 yards on 69 carries, including five keepers that found the end zone…It is this versatility and playmaking ability that enabled Fields to attract the interests of the likes of Stony Brook University, Eastern Illinois, Delaware State, and Rhode Island, all of whom have extended scholarship offers to the 6’4 resident of Yonkers…Fields wraps up his scholastic career having accumulated 3,702 total yards (2,898 passing, 804 rushing) and 42 total touchdowns (34 passing, eight on the ground). Brooks III, who may have set a record for most player of the week nominations, dominated on both sides of the ball for Ralph Carusillo’s Cougars…Called the cornerstone of the program by his head coach, the 6’1, 185-pounder from Central Islip, tallied 1,473 yards on 157 carries, reaching the end zone on 17 separate occasions. While utilized less in this aspect of the game, when called upon to do so, Brooks showcased his trustworthy hands, catching 14 passes for 250 yards…For good measure, he pulled off the trifecta by starring on special teams, returning one kick and one punt for touchdowns, to round out the 1,923 yards of total offense achieved by him in his swan song….Brooks III, an honors-level student who gets the job done as well in the classroom as he does on the grass, is presently entertaining offers from Lafayette, New Hampshire, Towson, in addition to local programs, Stony Brook and Long Island University-C.W. Post Campus. DePaulis, who like his AAA counterpart [Fields], made the most of all of his limbs as a dual threat QB, would have a knack for embracing the moment and elevating his level of play in big game situations. Never was this truer than in the “A” Championship game when he tossed three first half touchdowns en route to the Clippers’ 31-12 victory over Cardinal Spellman in locking up the program’s first title since 2006…A captain and role model in all endeavors, when DePaulis is done throwing for nearly 900 yards (54-for-103, 880 yards, and 12 touchdown passes) or running for an additional 547 yards with 13 ground touchdowns, he devotes his team to Christian service, volunteering at a neighborhood soup kitchen as a pure example of Matthew 25:40. 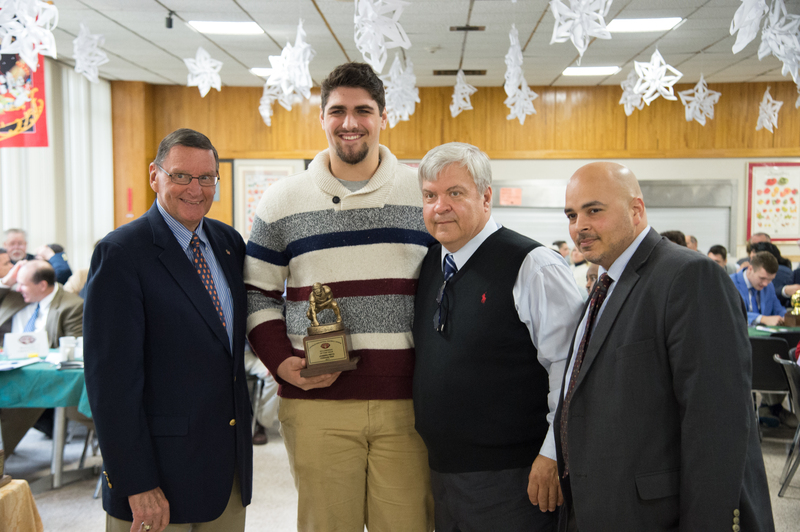 Refusing to be outdone were the three gentlemen who helped to keep points off the scoreboard in 2015, the Vincent O’Connor Memorial Defensive Players of the Year, Dan Negron (Stepinac; AAA Division), Frank Masella (Xavier; AA), and Tahriq Gordon of Nazareth. 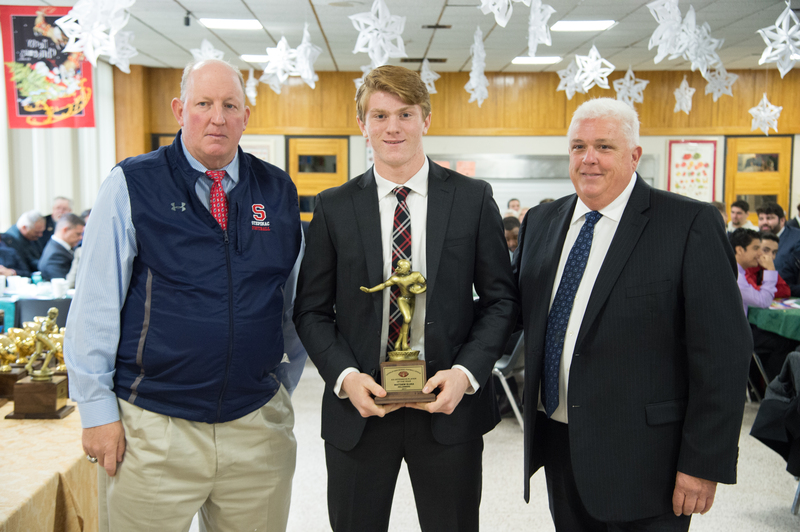 Negron, who became the second player in as many years from Stepinac to win this award (Gavin Heslop being the choice in 2014) was nothing short of remarkable in his third straight season starting at linebacker for the Crusaders…Finishing second on the team in total tackles (91) despite missing the first three games of the season while recovering from an injury, the 4.0 student averaged double digit stops for a second consecutive season, racking up 10.1 hits per game in 2015 after collecting 135 tackles as a junior (10.4/game)…Voted to the All-Catholic squad for the first time last Sunday, Negron’s other accolades this season included, but were not limited to being picked to be a member of the All-Hudson Valley 1st team, and earning an Honorable Mention citation on MSG Varsity’s All-Metro team….Negron wraps up his career with the following career totals: 308 tackles, 5 sacks, and 2 interceptions (the second of which came in the New York Catholic State finals and set up a touchdown to give Stepinac a 13-0 lead over St. Francis)….An individual whose best days still awaits him on the collegiate level, Negron has caught the eye of the University of Pennsylvania, Sacred Heart University, and a plethora of other schools that play in the Ivy and Patriot League conferences. 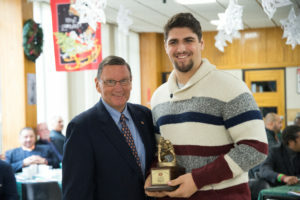 Masella, was the unquestionable anchor of a Knight defensive unit that surrendered only 11.1 points per game this season in claiming their second title in the past four seasons (previously won the AA division in 2012)…A runaway choice to the All-Catholic team for a second straight year, the 5’9, 200-pound linebacker amassed over 100 tackles (102 in 2014, 125 in 2015 in both his junior and senior campaigns….Setting Masella and his teammates apart from the rest of the field, was the way in which they consistently embraced the moment and peaked at precisely the right time. An example of their clutch play came in the 2015 AA semifinals when they held Offensive Player of the Year, Brooks III, scoreless for the first time all season in pitching a 14-0 shutout to avenge their 2014 playoff loss…The Queens resident sees his decorated career end with totals of 227 tackles, 29.5 TFL, and seven sacks. Gordon, who personifies all of the qualities that we seek in determining the most deserving candidate, is a person whose influence on the Kingsmen may only be fully acknowledged and/or appreciated in the years to come….Playing alongside a roster consisting of 10 freshmen and 10 sophomores, the stat line took a backseat to the Nazareth senior’s work as a peer mentor for his younger teammates…Described by the school’s Athletic Director, Rick Dolan, as “the first to arrive and the last to leave team functions,” Gordon routinely led study hall sessions and always found the time to lend an ear to a teammate in need of guidance…Reflecting upon three decades of experience, Dolan showed no hesitation in labeling the 6’4, 220-pound defensive end as one of the “best athletes to ever represent Nazareth.”…Gordon will bring his impeccable demeanor and championship attitude with him next fall when he officially becomes a Stony Brook University Seawolf. By no means excluded on Sunday were be the studs who serve as the backbone, foundation, and lifeblood on both offense and defense, A.K.A. the two-way linemen…A rare breed of warrior, these ironmen often get caught in the shadows despite being the ones who in many cases are doing the brunt of the labor. To step onto the field knowing that you are about to go to “war in the trenches” requires a person of unmatched courage, determination, and toughness. Unlike Las Vegas where what happens there stays there, when you are performing double duty, you bring those battle scars home with you on a daily basis. It is for this reason that the NYCHSFL makes it a priority to see to it that this beastly cohort be given the same level of admiration as their potentially more famous schoolmates…In consideration of all the attributes one needs to possess in order to excel in this capacity, there could not be better or more worthy candidates than Zach O’Neill (Monsignor Farrell), Lorenzo Worrell (Christ the King), or Michael Marinelli (Xaverian), the respective conferees of the Joe Thomas Memorial Lineman of the Year Award. Hardly be the largest physical specimen on the field at 6’2, 225 pounds, O’Neill made up for anything he lacked in God-given stature by playing with a wealth of heart…A two-year starter at tackle, it is no coincidence that in the years that he controlled the OL, fellow senior, Steven Viegas, ran for a pair of 1,000+ seasons (1,067 yards in 2014; 1,340 yards in 2015) and score 21 rushing touchdowns in earning All-Catholic distinction back-to-back seasons. As a pass protector, O’Neill provided teammate, the aforementioned Cloppse, with ample time in the pocket as the latter connected on nearly 60 percent of his throws for just under 1,000 yards and 11 touchdowns….Turning our attention to defense, despite facing more than his fair share of double teams, O’Neill flourished from his spot at DE, compiling 10 sacks as a pass rusher, and establishing the edge as a never-quit run stuffer….As exceptional a human being as he is an athlete, the Staten Island native participates in the Lions’ Bread for Life drive, is a consummate patriot as evident by his membership in the school’s Hearing Our Heroes Club, and further demonstrates his love of the game by volunteering as a youth coach. Worrell, who helped the Royals reach the AA title game for the first time since 2007, undoubtedly acted as a catalyst in all areas…Unlike his fellow Thomas recipient [O’Neill], it is impossible to overlook this behemoth of a young man, as Worrell stands 6’5 and tips the scales at an imposing 255 pounds. Despite these chart topping measurements, it is with total validity that we say that the completeness of his skills stood out above all else…A three-year starter for the Middle Village based program, as Worrell continued to develop/grow from year to year, so too did the number of checkmarks in the win column, as the Jason Brown coached squad moved from three victories in 2013 to 10 wins and a finals berth this past season…The degree to which Worrell contributed to this turnaround cannot be overstated. Lining up on the outside at tackle, the kid who calls Rosedale home played like a human bulldozer, disposing of anything that attempted to impede the Royals potent running game. 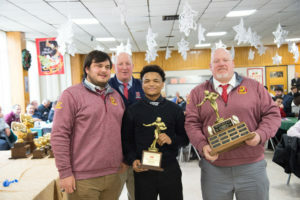 With their “big daddy” serving as the lead blocker in many an instance, Christ the King accumulated 2,500 yards and 43 scores on the ground, as four different running backs exceeded the 400 yard mark for the season. Living up to his billing as the total package, Worrell provided top notch pass protection, as senior field general, David Navas, enjoyed a fine year, hurling the pigskin for 1,208 yards and 12 TDs….While he made it impossible to touch his quarterback on one end, Worrell would be a nightmare for opposing QBs on the other, leading Double-A leader in sacks this season with nine (of his 56 total tackles)…A true master of all trades, Worrell even saw a little time at placekicker during the 2015 season, successfully connecting on 21 of 29 PAT tries….With many NCAA DI schools having reached out, the Royal senior is exercising patience and doing his homework before making this big decision. 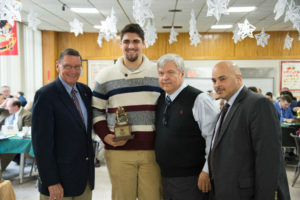 For the 6’4, 230-pound Marinelli, winning both the Thomas Award and the “A” Division title may only rank second and third among his most memorable feats in the past few months. A member of the Xaverian band that played for Pope Francis during the pontiff’s visit to New York in September, the senior defensive end made just as sweet a sound when hitting opposing ball carriers….Recording team highs in tackles (82) and sacks (10), it would be a family affair on the D-Line for the Clippers as Michael (12) teamed-up with younger brother, Anthony (20), to combine for an astounding 32 tackles for a loss….Surrendering more than 10 points only once this season to an “A” opponent, the third time ended up being the charm for the Clippers as they erased the painful memories of back-to-back finals losses in 2013 and 2014, by going undefeated (with four shutouts) in league games in 2015….Offensively, Marinelli moonlighted as a TE/SE, using his size efficiently as an overpowering run blocker for a team that piled up nearly 2,000 yards and 36 touchdowns from the ground…Like many of the student-athletes recognized last weekend, Marinelli’s most powerful tool is his brain as he maintains a 92 grade point average while enrolled in honors-level courses.